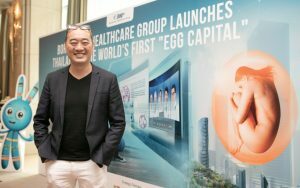 Bangkok (Thailand) – December 20, 2018 (travelindex.com) – Borderless Healthcare Group launches Thailand as the first Egg Capital of the world with the establishment of its high-tech IVF clinic franchise in the Kingdom of Thailand. AI-powered high-tech IVF clinic franchise “XY.life” will soon make its debut in Bangkok to democratise women in fertility management. AI-powered avatar will be made available at www.xy.life in the first half of 2019 to chat with women around the world who are interested to adopt social egg freezing in a pay-as-you-freeze model in any XY.life clinics. Subject to a range of biological, psychological and social data provided by a woman, the avatar can dispense a personalised financing plan for her fertility management. The plan may include social egg freezing cost for as low as USD2.95 per day in Thailand. “There are 1.8 billion millennials in the world and they have become the new audience of fertility management. In addition to delayed marriage and childbearing, many of the millennials are also facing new infertility threats which include work stress, unbalanced lifestyle, disturbed sleep-wake cycle, etc. Providing them with insights on fertility preservation like fertility functional diet, toxicity avoidance tips and options like social egg freezing before infertility kicks in, will be very helpful. Majority of the fertility clinics are focused only in managing infertility. We aim to transform the infertility industry to be a fertility preservation eco-system which can support millions of women, especially the millennials, to manage fertility before fertility becomes a problem,” says Dr Wei Siang Yu, founder and executive chairman of Borderless Healthcare Group. Many fertility doctors around the world have already signed up with XY.Life to become an advocate in fertility public health education to promote the new notion of ‘reproductive asset management’. Global experts in technology, fertility and media will be working closely with fertility doctors in Thailand to develop world-class protocols, technology innovations and centres of excellence in cryobanking in the Kingdom. Thailand, as a major tourism and medical tourism hub, will be positioned as a global player in comprehensive fertility management which is in line with the objective of the Tourism Authority of Thailand to enhance premium and niche tourism next year! Borderless Healthcare Group Inc (BHG) is a global leader in healthcare technology, media, telecommunication, service and content (TMTSC), managing more than US$100 million worth of intellectual assets and innovations via its ecosystem of subsidiaries from Smart Health, Smart Ageing, Smart Home to Smart Farm. BHG is positioned to transform traditional healthcare with disruptive innovations in Asia and beyond. The group’s global innovation footprint is supported by its Borderless Investment Alliance and the establishment of the first-of-its-kind Borderless Innovation Centres in China and across the globe.